In the latest bit of Mario Kart 8 news, Nintendo has compiled a helpful list of all the tracks that will be featured in the new game that's out later this month for the Wii U. As you've probably noticed, we've been talking about a Mario Kart lot lately, mostly just because the game looks pretty amazing. How amazing? Well, let's do the math. What do you get when you add up 32 race tracks, eight battle courses, and one next-gen Mario moustache? See the full list of courses below. When specified, the acronyms refer to the original console the remastered track appeared on. 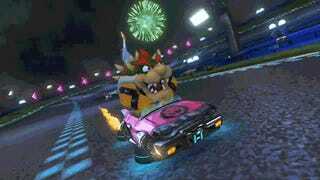 Yannick LeJacq will probably lose a lot in Mario Kart 8. Help him out by writing him at yannick.lejacq@kotaku.com or finding him on Twitter at @YannickLeJacq.